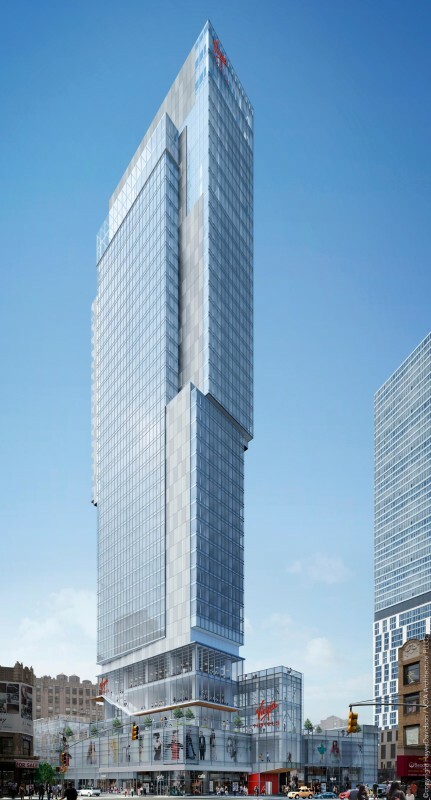 LAM Group and Virgin Hotels in collaboration with interior designer and architects at VOA, have broken ground on their 39-story tower on the southwest corner of 30th Street and Broadway in the NoMad neighborhood of Manhattan. Responding to Virgin’s demand of a “lifestyle” hotel product, VOA has topped a 90,000-square-foot retail podium with a 500,000-square-foot glass tower containing 465 rooms. Included in the tower is 30,000 square feet for amenity space such as banquet halls, meeting and conference centers, and a sky lobby club room with a private roof deck and pool. A vertical arrangement of embossed stainless steel panels breaking up the predominantly glass facade. The neighborhood north of Madison Square Park, hence its acronym, has witnessed an explosion of growth in the past decade, with several prominent hotels already in place, among them the Ace Hotel and NoMad Hotel, also on Broadway. ”The Virgin Hotel New York’s distinctive look is sure to play a key role in the NOMAD neighborhood’s transformation process,” VOA Principal Len Cerame said in a statement.